Do you want to understand the language of business and contribute in a more strategic role – we’re accepting applications for the fall! 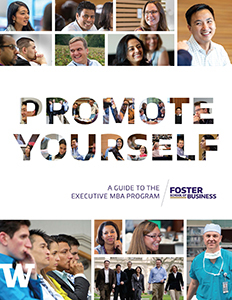 Not just for executives, the Executive MBA (EMBA) program at the UW Foster School of Business is a nationally-ranked, work-compatible program that provides a rigorous yet collaborative learning environment with highly experienced professionals from a variety of industries. In this 21-month program, coursework is immediately relevant—resulting in better decision making, improved managerial skills, and enhanced leadership abilities to solve real-world business and organizational challenges. See how students are using the EMBA program to accelerate their career. The Business of Healing — Joe Sniezek, MD/MBA, serves as a model of the modern physician-leader. What makes an Executive MBA different? Complete the form below to learn about our Executive MBA Program and how it has impacted the lives of our students.